Peter Korn will be out featured guest speaker at the Sept 20 Annual Guild Meeting. Peter Korn, is the founder and executive director of the Center for Furniture Craftsmanship in Rockport, Maine He has been a furniture maker since 1974. Peter has a degree in history from the University of Pennsylvania. He is also a writer, a philosopher and, when he has the time, an enthusiastic sailor. 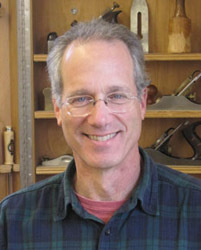 He is the author of Why We Make Things and Why it Matters: The Education of a Craftsman (Godine Publishing, 2013), Woodworking Basics: Mastering the Essentials of Craftsmanship (Taunton Press, 2003) and The Woodworker's Guide to Hand Tools (Taunton Press, 1998). Prior to founding the Center for Furniture Craftsmanship in 1992. Peter spent six years as Program Director at Colorado's Anderson Ranch Arts Center and four years as Adjunct Associate Professor at Drexel University teaching furniture design from 1980 to 1986. His award winning furniture has been exhibited nationally in galleries and museums.